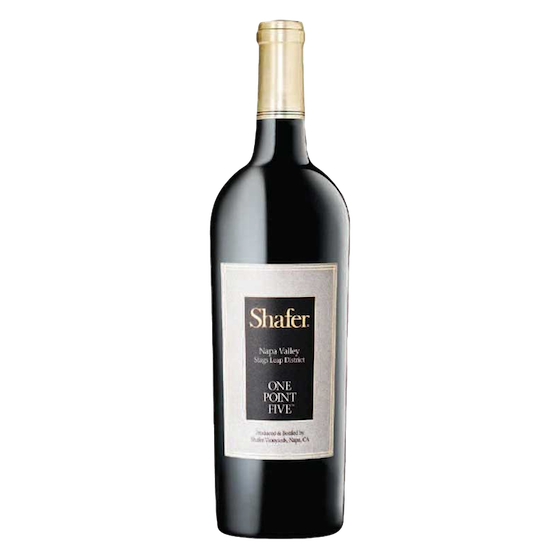 The 2016 Shafer One Point Five is a bold, expansive Stags Leap District wine with soft tannins and abundant fruit that is approachable when young, yet capable of aging gracefully. The wine’s name references the partnership between father and winery founder the late John Shafer and his son Doug, who took on the role of winemaker in 1983. Their working relationship lasted for over 30 years. “One Point Five” was coined to mean “a generation and a half” to reflect the overlap in generations, as opposed the the traditional second-generation winery story. From the first vintage, “One Point Five” has consistently reflected the Shafer style and commitment to quality. 2016 was the fifth in a string of ideal vintages: dry and warm, with consistent daytime heat and cool evenings, the growing season yielded tiny berries with concentration, rich colour, and enticing aromatics. The resulting wines have excellent structure and extraction; they’re destined to cellar beautifully. This wine combines fruit from two Stags Leap District sites: Shafer’s hillside estate vineyard and the “Borderline” vineyard, located just south of the winery. Approximately 90% Cabernet Sauvignon, with a small quantity of Merlot and Malbec, it was aged for approximately 20 months in new French oak barrels.